From as early as the medieval times, food has been a way to show a family’s wealth, style, and general wellbeing. Food can be used to entertain, dazzle, or even can be used simply as a means of survival. Today, individuals travel the world to try foods from different cultures. However, it is easier than ever to prepare international dishes from the comfort on one’s own home due to the overwhelming amount of cooking shows, books, and blogs available to the general public. Cooking shows got their start on the radio, transitioning to television in the 1940s. The first televised cooking show in the world was in the United Kingdom, aired on BBC on Wednesday June 12, 1946. This program was called “cookery” and was only ten minutes long, where the chef in the first episode made lobster. In the beginning of cooking TV shows, they were often used to promote rationing-friendly meals during WWII. Now, cooking shows range from competitions, to how to videos, to even creating extravagant and specialty meals and cakes for display. 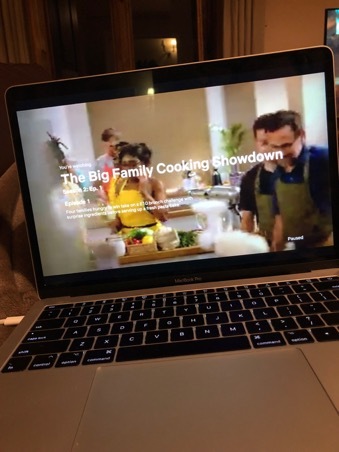 Cooking shows have even started to move off television and into individual’s everyday lives through the internet. There are many companies showing short “how to” style videos for recipes on blogs and social media websites. Some individuals may watch these shows and videos to learn how to cook the dish, while many watch for the art form that is cooking. Beautifully created dishes can both be pleasing to the eye and stomach, and it is mesmerizing to watch a chef create these stunning dishes. This entry was posted on Friday, March 15th, 2019 at 9:00 am. It is filed under Florentine Foodie. You can follow any responses to this entry through the RSS 2.0 feed.